Yup, yup, still checking out books for girls in great anticipation of adding one to our mix! Here are a few titles that I think are perfectly charming and FUN for little girls. I look forward to sharing these with my own. 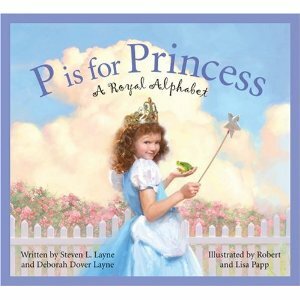 P Is for Princess: A Royal Alphabet is a title from Sleeping Bear Press. If you have a little girl who likes princesses - both fictional and non - then you will be greatly interested in this title. We start with A which is of course for Aurora who you might recognize as being the proper name of Sleeping Beauty. Traipsing through the alphabet we learn about real-life princesses, such as Diana Princess of Wales (or, The People's Princess) and Grace Kelly who married Prince Rainier of Monoco. We also learn of kings and emperors and ladies-in-waiting. Naturally you can't be a real princess with out a tiara! The illustrations are this book are unique in that they are done by two different authors - a married couple - Robert and Lisa Papp. You can tell the difference when you are reading about a fictionalized fairy tale princess and a non-fiction true-to-life princess. The illustrations vary to suit the mood of the person or character in question which I think is unique and gives the book a feel of accuracy. What little girl doesn't enjoy paper dolls? 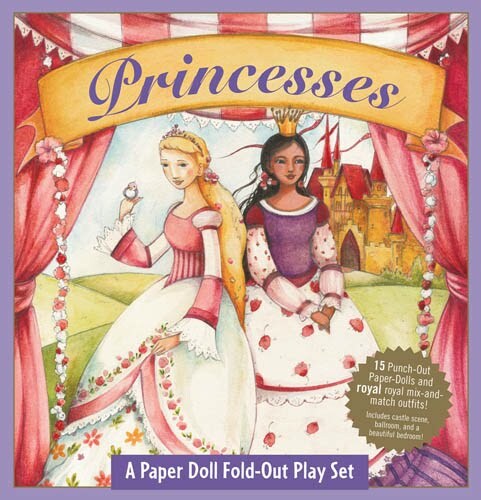 Princesses: A Book and Paper Doll Fold-Out Play Set is provided by Peter Pauper Press and is stunning in its detail and quality. There are eight "royal dress-up paper dolls" in this set with 22 outfits to choose from (among a myriad of accessories.) There are two fold-out scenes with which you can place the royal highness's - one scene with a unicorn and another in her bedchamber. The book also includes a very safe play pocket to store the dolls and accessories after they have been punched out. What a wonderful, imaginative play set! Naturally it holds up against Peter Pauper Press's standards of quality making this a very nice gift and play set. Thank you, Sleeping Bear Press and Peter Pauper Press for creating things to both delight and inspire the imaginations of little girls. I appreciated having the opportunity to inspect them and I'm excited to share them with my daughter. those are great books we love them. any type of Alphabet book is fun. I have not seen the Princess one - cute! You should contact Dawn and be the next blogger interviewed for her "Meet another Book Blogger Monday" post. I like sleeping bear press alphabet books ... so far we have O is for Old Dominion (the one for our state) ... I'm sure we will collect more. Thanks for sharing. I'll have to keep an eye out for P is for Princess. M pulled out the S is for Smithsonian book you sent us last week. He loves reading it. Thanks again! These sound sweet. I like the idea of the illustrations done by a man and wife. We're reading another princess story this week too -- The Ordinary Princess. Seems to be going over quite well so far!